As a change to the advertising in London tube stations, a group paid to remove it from one station and replace it with great cat photos! These photos are charming everyone who goes through the Clapham Common station! Who wouldn’t want to use public transit if all stations were so cleverly adorned with darling photos rather than annoying ads! The cats will up for two weeks. Next up, dogs. The following video shows how two very different species can care for each other. Keep in mind that cats are carnivores and hunters, and that rabbits are prey animals. They are two species that one might think are not compatible, or safe to have in each other’s presence. But they are! The message for today is Get Along With Others and Coexist as those who are different have something to share – like friendship and a nice facial! Cats and rabbits are both fastidious animals, each animal loves to have sparkling clean fur, and they both enjoy grooming others – even cleaning up another species! 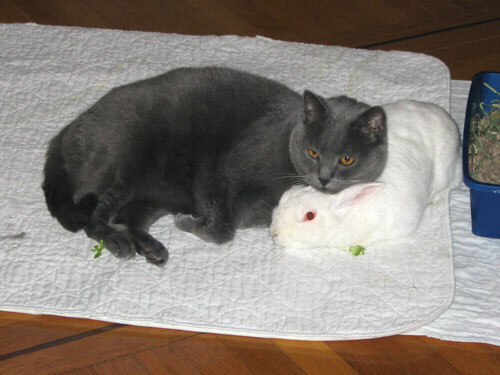 Our cat Jacques Frost groomed and napped with his love Irene the bunny up to his last 3 days on Earth. Cat Video: The Food Is Mine, No It’s Mine! Two cute kitties have different opinions on who the food bowl belongs to. Amusing to see their determination, but in real life every cat needs their own food bowl.